The Hobbit seems such an obvious choice (in a good way!) 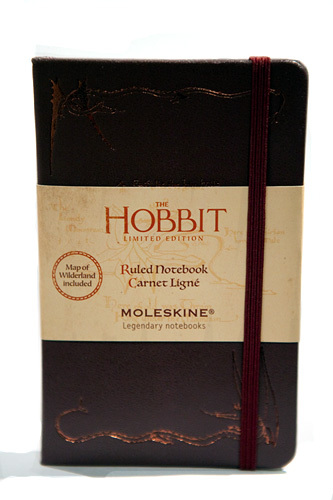 for the folk at Moleskine to tackle, and both of the designs they've created to tie in with Peter Jackson's adaptation do a beautiful job of capturing that old-world fantasy whimsy that so many of us associate with the story. The one we'll be looking at is the stunning burgundy and bronze ruled pocket notebook. COVER: Hard Cover, Foil Stamped and Silk Screen Printed. As we've come to expect from Moleskine products, this notebook is of high quality and everything from the gorgeous debossed cover to the special surprises included reminds us exactly WHY we pay extra instead of just buying a 99c notebook from the supermarket. 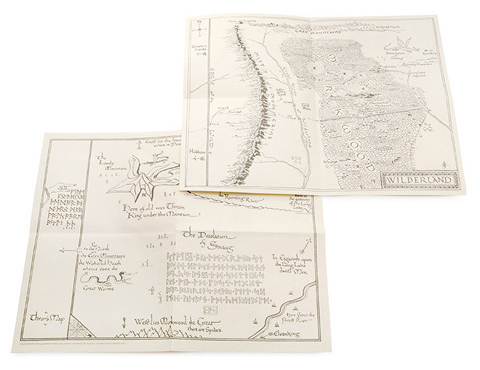 Along with a map of the Lonely Mountain, you get not one, not two, but THREE Smaugs on the cover! If that's not value then I don't know what is. The spine also features JRR Tolkien's 'JRRT' monogram. Absolutely love the 'Having the honour to remain yours deeply' on the ownership page. Sure, Gandalf doesn't seem too impressed, but this is a guy who can make a dragon out of fireworks, so he's going to be hard to please. 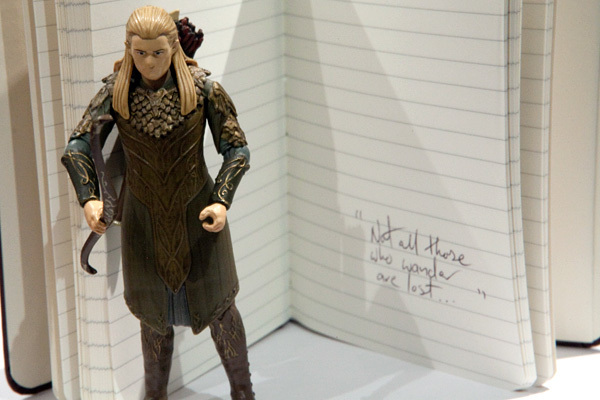 For the record, I took these photos BEFORE I actually saw the movie, so I assumed using my Hobbit-packaged Legolas as a prop was going to be totally fine. Thanks for not actually including him in the movie, PJ. Sigh. The special surprise I mentioned before is a double-sided map tucked into the back of the book, featuring Wilderland on one side, and a zoom-in of The Lonely Mountain on the other. All in all a really nicely put together package that fans of Middle Earth are sure to love. Both designs and both sizes (pocket and large) are available to buy from Nation State. 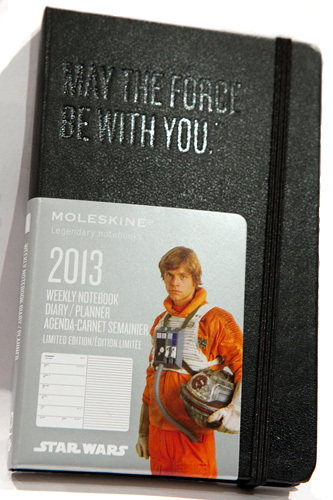 A long time ago, in a galaxy far, far away they were probably using some sort of high-tech computerised implant to keep track of all their dates and appointments, but because we live on planet Earth in 2013, we get the pleasure of using the 2013 Star Wars themed diaries from Moleskine. 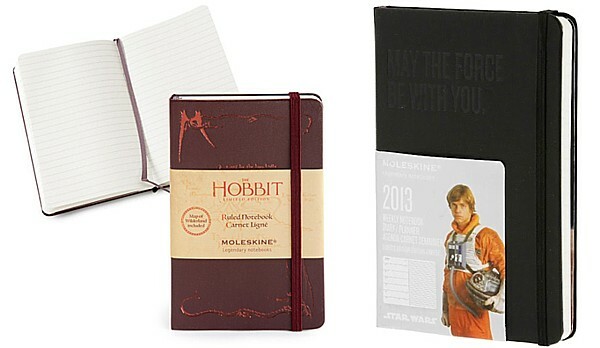 These guys come in weekly and daily planners, pocket and large sized, and feature some of our favourite characters from the trilogy. Yes, THE trilogy. I can't imagine 'MESA BOMBAD' would have looked quite so stirring debossed on the cover of a diary. EXTRAS: Moleskine History Inside. Expandable Inner Pocket. Address Book Insert. Our bonus present this time around is a postcard of the featured character and tagline. 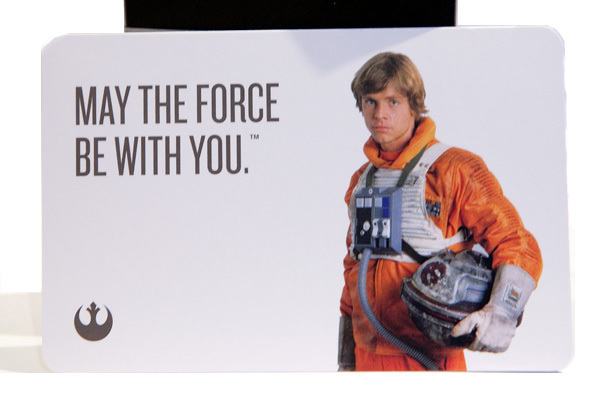 The Weekly Pocket diary I received has Luke and the famous Jedi catchphrase, but the other variations include Han Solo, Darth Vader, and Yoda. The choice of 'Here's where the fun begins' for the Han Solo version doesn't strike me as the most obvious or iconic option, but I guess it works for a new diary in a new year! Another great design on the ownership details page, but a black background possibly wasn't the most practical option. Though, any excuse to buy a nice new pen with silver ink is good enough for me! At the back you can just see the slip-in address book poking out. It's able to be easily removed if not needed. 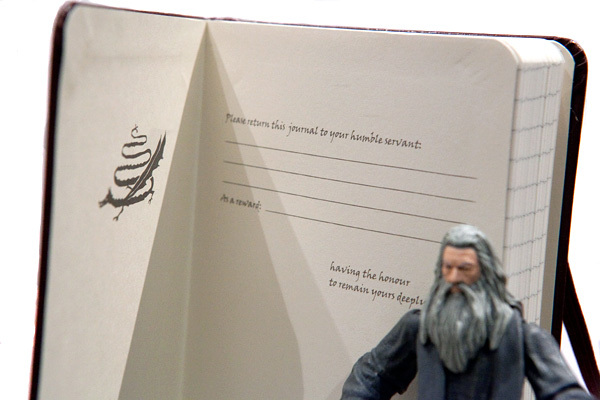 Each diary page is accompanied by a notebook page, presumably to jot down your plans for overthrowing the Empire. 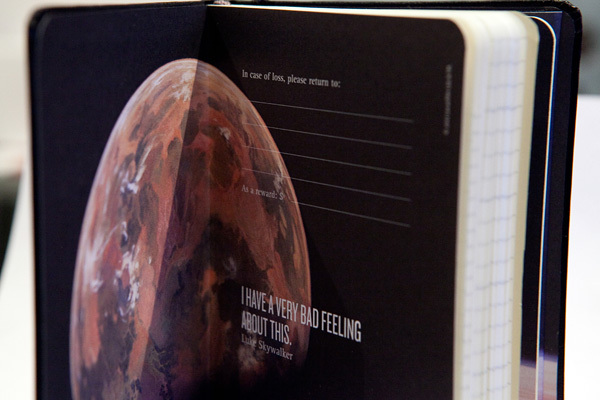 It's an incredibly handy idea; I wish more diaries included such frequent blank pages! Where the diary falls down a little for me personally is the tiny spaces set aside for the weekends. I do a lot of stuff on the weekends, and I think I'd be struggling to squish it in. 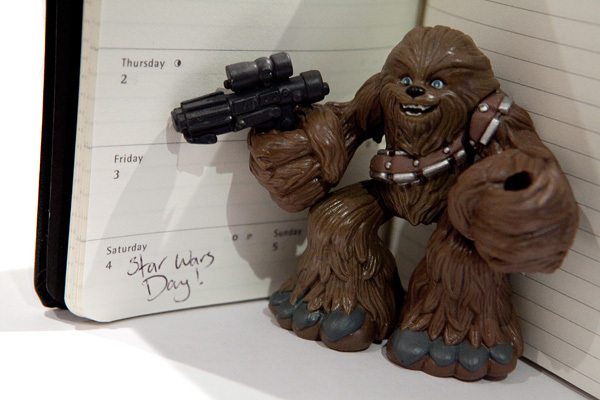 This diary would be great for a work diary, but if I wanted an all-rounder I'd have to take the step up and get the Yoda-themed large size. 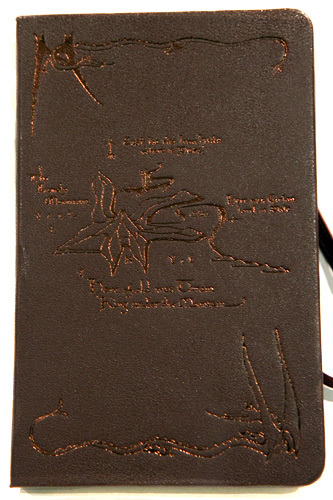 As with the Hobbit notebooks, all variations are available from Nation State. Nation State is based in Melbourne, Australia and carries not only these super rad items, but heaps of other diaries, notebooks, pens, pencils, mugs and other essentials. Shipping is free on orders over $55 within Australia, and for our overseas readers they most certainly do ship internationally. Clearly there's no excuse not to grab both of these little beauties, and you might as well grab a LEGO Moleskine (as reviewed by us back in May) while you're there!